Located on the east bank of Black Otter Creek, the Village of Hortonville WWTP experienced two major construction upgrades, all on the same site on which the original WWTP was constructed in 1949. The first reconstruction project took place in 1982, utilizing rotating biological contactors as the secondary process with phosphorus removal accomplished through chemical addition. The current design, that came online in the fall of 2010, utilizes a Sequencing Batch Reactor process. The Village of Hortonville's new wastewater treatment plant was designed to use an enhanced biological phosphorus removal process for the removal of phosphates. The average design flow is 0.50 million gallons per day (MGD), with peak flow capabilities of 1.25 MGD (typically only seen during periods of extended wet weather). The common element all enhanced biological phosphorus removal (EBPR) systems share is the utilization of phosphate accumulating organisms (PAOs). Hortonville's new treatment plant is designed with two separate basins known as Sequencing Batch Reactors (SBRs), and it is within these reactors that all treatment processes take place. The process calls for the environment in these basins to alternate from an anaerobic condition to an aerobic environment and back again multiple times. This process takes place in one single basin, unlike some traditional plants that rely on multiple tanks to do the same amount of work. In the anaerobic stage or oxygen deficient environment, the PAOs consume the abundant volatile fatty acid compounds in the incoming wastewater while simultaneously releasing phosphates back into the water. When oxygen is supplied to the basin, this creates an oxygen rich environment known as the aerobic stage of the process. It is during this stage that the phosphorus accumulating organisms consume more phosphates than they can digest which results in the net removal of phosphorus from the wastewater stream. Once the PAOs have had their fill, the oxygen to the basin is turned off and the organisms are allowed to settle to the bottom. This settled biomass is now referred to as sludge. From here it is pumped over to aerobic digesters for further treatment prior to land disposal. The treated wastewater is discharged into the Wolf River via a force main. Solids are aerobically treated in digesters before this nutrient rich material is injected into agricultural fields for use as a soil supplement. 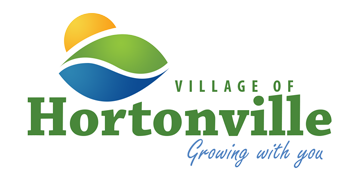 The goal of the Village staff is to provide cost effective wastewater treatment and environmental protection for the citizens of Hortonville and the Wolf River Basin. Facility tours are provided for the public upon request. Sewer backups are an unfortunate but common problem in U.S. cities and towns. Although municipal departments make every effort to prevent such incidents, they still may occur. Information is offered here to help property owners and residents understand why backups happen, how they can be prevented, and what steps citizens should take if a sewer backup affects their property. Click here for more Sewer Backup information.